These baskets are of coil stitched construction, which is the most difficult type of basket weaving. Coil stitching produces a tightly woven basket with thick walls. This process requires skill and experience to keep the inner coil at the right thickness while stitching the outer wrap over the coil with a needle. These baskets are made from papyrus stalks on the inside of the coils and palm leaves around the outside. 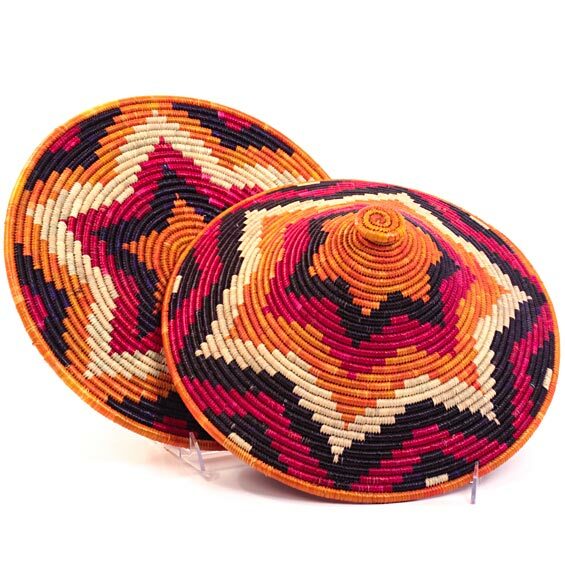 These traditional baskets feature distinctive bright colors and intricate patterns. The palm leaves give a sheen to the surface of the baskets.